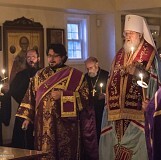 From Friday the 23rd to Sunday the 25th of March, the First Hierarch of the Russian Church Abroad, Metropolitan Hilarion of Eastern America & New York, performed an archpastoral visit to St. Mary of Egypt Church in Roswell, GA.
On March 17-18, the Sunday of St. John Climacus, Metropolitan Hilarion of Eastern America & New York visited the Church of the Icon of the "Reigning" Mother of God in Charlotte, NC, and led the divine services. On Friday, March 23, His Grace Nicholas, Bishop of Manhattan (temporary administrator of the Western European Diocese), arrived in the Cathedral of the Exaltation of the Holy Cross in Geneva, Switzerland. On Monday, March 19, the myrrh-streaming icon of the Mother of God "Softener of Evil Hearts" arrived at the Hermitage of the Holy Cross in Wayne, WV. 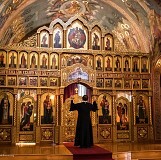 The icon has been touring in the United States, coming most recently from the Cathedral of St. John the Baptist in Washington, DC. On March 25, the Sunday of St. Mary of Egypt, the Sacrament of Holy Unction was performed by local clergy in Holy Archangel Michael Cathedral in Paterson, NJ. 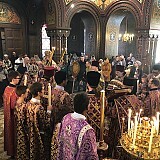 On Monday the 19th and Tuesday the 20th of March, the feast of the Forty Martyrs of Sebaste, Eastern American Diocesan vicar Bishop Nicholas of Manhattan paid an archpastoral visit to St. Alexander Nevsky Diocesan Cathedral in Howell, NJ, and led the divine services there. At the conclusion of the retreat, the clergy, enriched by their interaction with their brother clergy from across the Eastern American Diocese, returned home, bringing with them the myrrh-streaming icon of the Mother of God "Softener of Evil Hearts" and her guardian, Sergei Fomin. 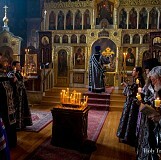 On March 18, the Sunday of St. John Climacus, the Sacrament of Holy Unction was served in the Church of the New Martyrs & Confessors of Russia in Brooklyn, NY. 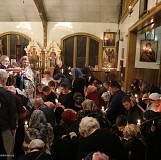 Over 250 Orthodox Christians, including parishioners of church in Brooklyn and across New York, participated in Holy Unction. 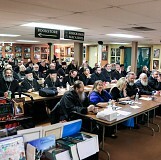 On March 12-14, the clergy of the Eastern American Diocese and the Patriarchal Parishes in the USA held a joint Lenten clergy retreat in the Diocesan Center at St. Alexander Nevsky Cathedral in Howell, NJ. We offer our readers an extended photoalbum of the retreat here. 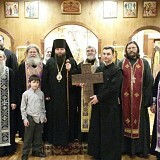 On March 11, the Sunday of the Cross, St. John Cassian Chapel in Bessemer, AL was visited by Archimandrite Maximos (Weimar) of the Brotherhood of St. Dionysios the Areopagite in St. James, NY. Fr. Maximos brought with him the Brotherhood’s relic of the True Cross for the faithful to venerate. 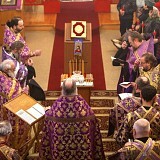 On Wednesday, March 14, the Lenten Retreat for clergy of the Eastern American Diocese and the Patriarchal Parishes in the USA concluded with the Liturgy of the Presanctified Gifts. In keeping with recent tradition, the retreat took place on the fourth week of Great Lent, following the Sunday of the Cross. 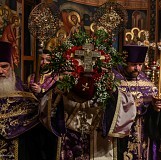 On March 11, the Sunday of the Cross, Eastern American Diocesan vicar Bishop Nicholas of Manhattan led the Sacrament of Holy Unction in Holy Myrrhbearers Church in Brooklyn, NY. On Monday evening, March 12, the annual Lenten Retreat for clergy of the Eastern American Diocese convened in the Diocesan Center at St. Alexander Nevsky Cathedral in Howell, NJ. Clergy from across the Diocese were in attendance. 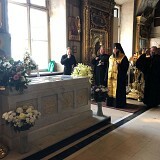 On March 11, the Sunday of the Cross, Metropolitan Hilarion of Eastern American & New York, First Hierarch of the Russian Church Abroad, celebrated Divine Liturgy in the Synodal Cathedral of the Sign in New York City. 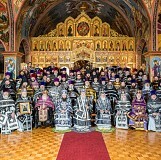 On Friday, March 9, the feast of the First and Second Findings of the Head of St. John the Forerunner, Metropolitan Hilarion of Eastern America & New York paid an archpastoral visit to St. Panteleimon Church in Hartford, CT, where he officiated at the Liturgy of the Presanctified Gifts. 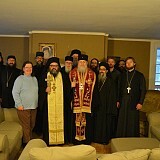 On Wednesday, March 7, Metropolitan Hilarion of Eastern America & New York paid an archpastoral visit to the new premises of the Monastery of St. Dionysios the Areopagite in St. James, NY. 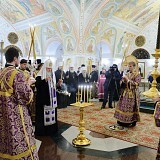 His Eminence met and spoke with the brethren, after which he served a moleben and blessed the new monastery building. 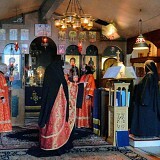 Since the time of Archbishop Averky (Taushev; +1976), there has been a tradition for a ruling or vicar bishop of the Eastern American Diocese to visit Protection of the Mother of God Church in Rochester, NY every years on the second Sunday of Great Lent. 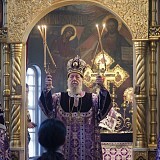 This tradition was continued, first by Metropolitan Laurus (+2008), and currently by His Grace Nicholas, Bishop of Manhattan. 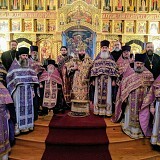 On March 4, the Sunday of St. Gregory Palamas, Metropolitan Hilarion of Eastern America & New York visited Holy Myrrhbearers Church in Brooklyn, NY, where he celebrated Divine Liturgy. On Monday, February 26, a multitude of the faithful gathered at the Synodal Cathedral of the Sign in New York City to bid farewell to Prince Vladimir Kirillovich Galitzine, the cathedral’s warden for over 40 years. 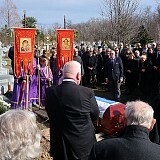 The funeral service was led by the First Hierarch of the Russian Church Abroad, Metropolitan Hilarion of Eastern America & New York. 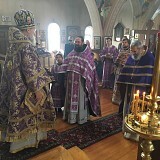 After celebrating Divine Liturgy in Nativity of the Mother of God Church at the New Kursk Root Hermitage in Mahopac, NY on the Saturday of the Great-Martyr Theodore Tyro, His Grace, Bishop Jerome, set out for Holy Trinity Monastery in Jordanville, NY. 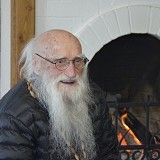 On Saturday, February 24, Schema-Archimandrite Averky (Shvetsov-Zagarsky), eldest cleric of the Belyov Diocese and the Nativity of the Theotokos Monastery in Anastasovo, Tula Oblast, reposed in the Lord. He was 102 years old.